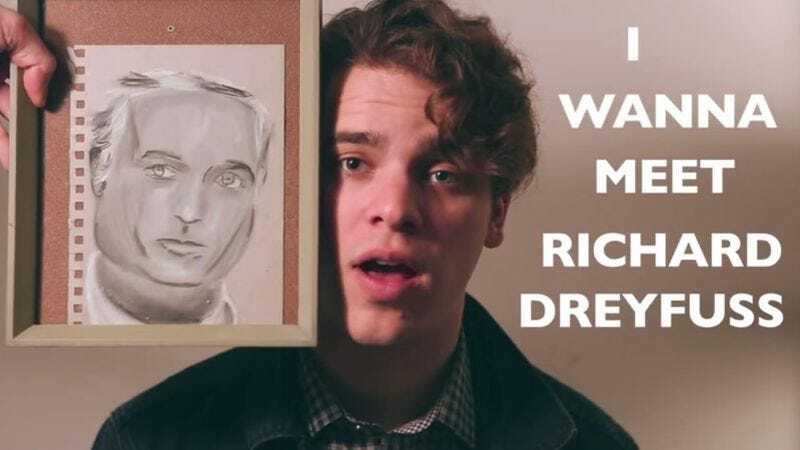 It’s important to have goals and YouTuber Gabriel Gundacker has expressed his in song with “I Wanna Meet Richard Dreyfuss.” The surprisingly soulful ditty is exactly what its title suggests: an impassioned plea for a personal encounter, however brief, with the Oscar-winning star of The Goodbye Girl, American Graffiti, Stakeout, and Another Stakeout. Why does Gundacker feel so strongly about this issue? The lyrics offer some clues: “I wanna see how his bald head shines / How the light reflects on his mustache.” Still, the singer-songwriter’s true motives are cloudy. At times, the song sounds like the work of an obsessed fan who has crossed some kind of important line with inappropriate musings like “What does he smell like?” At other times, however, it seems possible that the unreliable narrator of the song is simply trying to harvest some choice Richard Dreyfuss data—including his e-mail address, license plate number, and Hulu password—as part of an ill-advised identity theft scheme. The Mr. Holland’s Opus star is hereby put on notice. Either way, the results are tuneful and earworm-friendly, enough to brainwash listeners into believing that they, too, want to meet Richard Dreyfuss and ask him questions about Stand By Me, What About Bob?, and, time permitting, Jaws. In furtherance of his monolithic, all-roads-lead-to-Richard-Dreyfuss cause, Gundacker has set up a dedicated web site (meetricharddrefuss.com) for anyone who can help him fulfill his destiny. The world—or at least Gabriel Gundacker—awaits an adorably flustered response from Dreyfuss himself.